When I learned Scottish director Jon S. Baird had made a new film about the classic comedy team Laurel and Hardy, I assumed this would be a standard biopic about how the two met, created their shtick, and reached the top. Instead, “Stan & Ollie” begins in 1937 when Laurel and Hardy were literally on top of the world; they were the top motion picture draw of the day, and their films were one big hit after another. Fast forward to 1953. By now Abbott & Costello were the top comedy duo in America, and most homes had televisions. People simply didn’t go to the movies twice a week the way they used to. And Laurel and Hardy were bygones of another era. The bulk of “Stan & Ollie” centers around their attempt at a comeback by touring the United Kingdom in a series of live performance stage shows at various theatres. 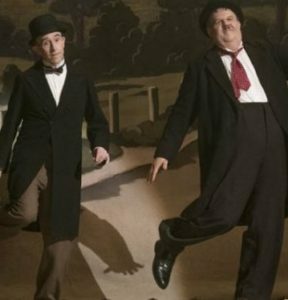 The actual purpose of the tour was to lure a British film producer to one of their shows and then sell him on the idea of putting Laurel and Hardy in a new picture. Unfortunately, this project never materialized, but the tour provided the duo with a last hurrah of greatness before Oliver Hardy’s declining health forced the pair to cease performing permanently. As is common knowledge, Stan Laurel (actor-comedian Steve Coogan) was the brains behind the act, even though he played the “dumb one.” During the British tour, he spends the bulk of his down time writing new bits and gags for the ill-fated film project which never came to fruition. Oliver Hardy (John C. Reilly, in another brilliant “sad sack” performance) continues to play the horses and chase publicity. Without using cumbersome flashbacks, Baird lets us know Hollywood mogul Hal Roach had Laurel and Hardy under separate contracts which were not up for renewal at the same time. When Stan Laurel opted to take his services elsewhere, Oliver Hardy made one picture without him – a source of friction that comes to a head during one of their dinners in England. Unfortunately, Laurel and Hardy were products of the old studio system – in which they were not allowed to personally profit from their own success. That they were forced to struggle to make a comeback less than twenty years after the height of their success lends a certain amount of sadness to a biopic about one of the funniest comedy teams in history. “Stan & Ollie” is a bittersweet ode to Laurel and Hardy. 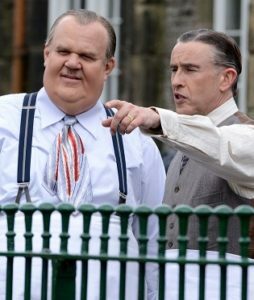 Coogan and Reilly nail their parts so well that we feel like we’re watching the actual subjects, even though we know we’re not. The two stars may fight and bicker behind the scenes, but when the cameras are rolling or the audiences are watching, they are always “on.” The chemistry we see throughout “Stan & Ollie” is obviously one built through many years of performing. These two know what audiences expect from them. And boy do they deliver. Every time. In a way, “Stan & Ollie” is reminiscent of “Butch Cassidy and the Sundance Kid.” In that film, we join Butch and Sundance (Paul Newman and Robert Redford) late in their careers. By this juncture, they already know what makes each other tick; they know their nuances, and they operate (as thieves and robbers in the Old West) as a well-oiled machine. We get that from “Stan & Ollie” too. In a way, we learn more about Laurel and Hardy by eavesdropping on the end of their career than re-hashing its beginning. More bittersweet? Yes. But more informative? Absolutely. And a nod should be made to Nina Arianda and Shirley Henderson, who play the wives. Their roles are more than mere support. Screenwriter Jeff Pope has fleshed out their importance so that we understand Laurel and Hardy each had lives outside of their act. Their wives (at least the third for each) provide crucial guidance during this difficult period; plus they are personal friends to one another. When the four of them are on screen together, “Stan & Ollie” shines its brightest. The inclusion of the characters of the spouses is ingenious in that it helps our understanding of the two leads. Is “Stan & Ollie” one of the year’s greatest achievements in filmmaking? No. But it’s a damn sight better than most films you’ll see. And Coogan and Reilly are brilliant together. They are each deserving of acting honors, although it’s impossible to say one outshines the other. Much as with Laurel and Hardy themselves, “Stan & Ollie” is a team effort.